Most landlords who own properties built during the 1960's and 1970's era in the industrial building sector probably have had asbestos cement products used to construct the properties. Probably the most commonly used material was asbestos cement, which was used as a roofing material. Fairly commonly in what's known as the Big Six and the alternative of the Big Three, which is a ribbed asbestos sheet that is fixed to a steel frame, usually with roof lights. Over the years asbestos cement has been considered to be dangerous to health (please see our alternative article on asbestos to know more about this). Generally it is considered a product that should be replaced where found or sealed to make safe or overclad to make safe. By safe in this context we mean sealed, so that no fibres that become exposed with deterioration can cause a health hazard. Asbestos cement roofs, the danger in waiting? Asbestos cement roofs, so commonly used, are hidden away from eyesight and investment landlords perhaps rarely visit the property so are not aware of the problem on a day to day basis. The managing agent is more focused on renting the properties, in a good market to the best covenants in a bad market to an acceptable covenant. Asbestos reports, are they needed? In most modern leases there is a covenant regarding statutory obligations/compliance and part of this is to have an asbestos survey carried out, often referred to as a Type 2 asbestos survey (from our limited knowledge of this and we are not asbestos surveyors). This is a non-evasive test that identifies danger areas. Often the asbestos roofs only come to light when the premises change hands and perhaps a dilaps schedule is served, which maybe has an ambiguous clause to overhaul the roof or that the landlord's and tenant's surveyors will jointly inspect the roof if problems come to light. Over the years we have found everything from the basic cracked asbestos sheets to repairs where a similar sized glass reinforced plastic sheets have been inserted in, to a clear sheet such as a roof light. Basic repairs where a liquid tar has been used or a Flashband type sticky felt product, all to varying degrees of success depending on the skill used by the tradesperson. Asbestos cement a life of 30 years? 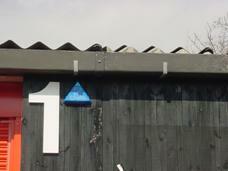 We were asked to put a specific number of years on an asbestos roof before major maintenance is required. Generally we would say about 25 to 30, but this depends of course upon the situation of the roof, the detailing, accessibility of maintenance to clear valley gutters, for example, overhanging trees, etc, etc, right down to the skill of the minor repairs that have been carried out over the years. We recently came across one example of a roof deteriorating that was close to a motorway due to the salt that was being put on the roads getting onto the roof and attacking the fixing bolts. 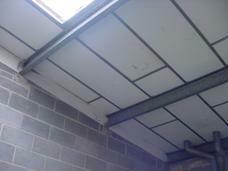 Equally, problems can occur with the fixings of the asbestos sheets too when the bolts deteriorate. This can be because the original metals they were made of, the lack of cover or protection, the constant wetting from a valley gutter that gets blocked and backs up with water, to a poorly fitted new roof sheet repair. A roof that has deteriorated badly will need to be repaired, replaced or encapsulated. These can be difficult as asbestos cement is not made in any quantities today and therefore repairs are normally carried out in glass reinforced plastic sheets or equivalent on asbestos cement sheets. We have also come across difficulties in matching the older sheets with the newer sheets. 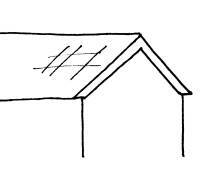 If the roof were considered dangerous, or future deterioration would make it dangerous, then encapsulation with a metal profile sheet roof. Whilst this doesn't remove the problem it does encapsulate the asbestos roof, which in theory, therefore stops the asbestos fibres from being transferred. 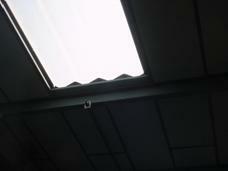 There are, however, problems with metal profile sheet roofs. Please see later on in this article. Removal of asbestos can be a costly business for many reasons. Firstly, it may involve the relocation of the tenants, unless you propose putting a temporary roof structure above the asbestos roof, as removal of the asbestos will have to be carried out in a safe manner and therefore the area enclosed, which all adds to the cost if the tenant is to stay in situ, and we are not certain it is advisable anyhow. 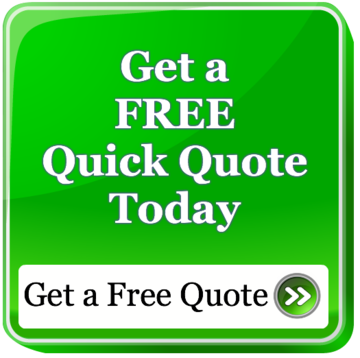 If you need help and advise with regard to asbestos, asbestos cement, leases, dilapidations, schedules of condition, dilaps claims, scott schedules building surveys, structural reports, engineers reports, specific defects report, structural surveys, home buyers reports or any other property matter please call 0800 298 5424 for a friendly chat. All rights are reserved the contents of the website are not to be reproduced or transmitted in any form in whole or part without the express written permission of 1stAssociated.co.uk.